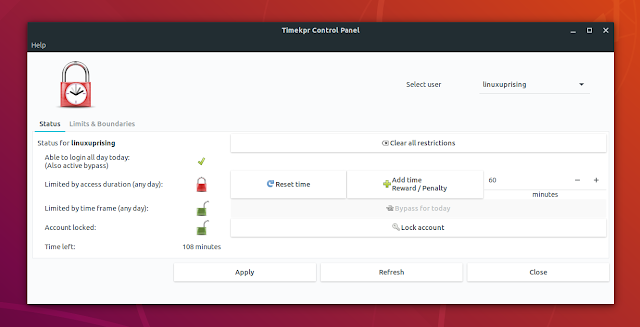 If you're looking for an easy to use tool with a graphical user interface for parental controls for Ubuntu, I recommend giving Timekpr Revived a try. Using Timekpr Revived, you can control the computer usage for certain user accounts by setting some predefined access rules. Timekpr Revived is a fork of the old Timkpr application, which was initially updated with Ubuntu Unity support, but later received many other improvements, including porting the UI to GTK3, support for newer Ubuntu versions, and so on. In recent weeks, Timekpr Revived has received support for KDE Plasma (the developer tested it in Kubuntu 18.04), as well as some important Ubuntu 18.04 (Gnome) fixes. As a result, Timekpr now runs in Unity, Gnome, KDE, Xfce, and MATE. Since I use Gnome, that's the only desktop environment in which I personally tried it though (on Ubuntu 18.04). 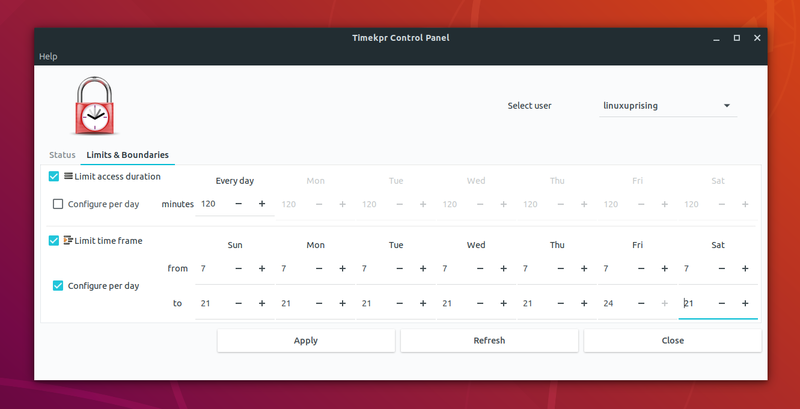 Timekpr may work on other Linux distributions, but the main focus is Ubuntu - its developer tests it only on Ubuntu as far as I know, so I'm not sure if it works without any issues in other Linux distributions. While Timekpr Revived works quite well, its developer has started working on a DBus-based rewrite of Timekpr, which should include a wider control of time, options to disable access to some websites, have a proper database underneath which displays statistics, and more. The new version developement is quite slow though, and it's not yet known when a fist release will be available. 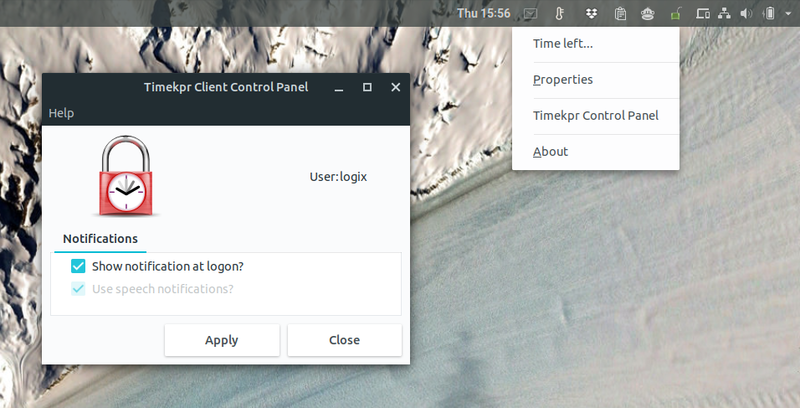 To use Timekpr to limit an user's login time duration or access hours, launch Timekpr from the menu thing (or select Timekpr Control Panel from the Timekpr tray menu). Next, select the user for which you want to limit the access time, click on the Limits & Boundaries tab and select the schedule you like. Do this for each user that you want to have limited access to the computer. I guess this should be obvious but I thought I'd mention it anyway: the user for which you limit the login time duration / access hours shouldn't have admin access, or else the user can change or remove the parental control access limits, rendering this tool useless. The remaining time can be accessed by left clicking on the tray icon (on desktops which support different actions for left and right click, like Gnome). Right clicking the Timekpr tray icon should open a menu which lets the user consult the remaining access time, configure logon notifications, and access the Timekpr Control Panel but this only opens if the user is able to input the admin password. Another important thing I'd like to mention is that the Timekpr Revived tray icon didn't work for me in Gnome Shell, even by using the Ubuntu Appindicators extension (installed by default in Ubuntu). A workaround to get the Timekpr tray icon to show up in Gnome is to have the Unite extension installed with the Show system tray icons in top bar option enabled, or install other Gnome Shell extensions such as TopIcons or TopIcons Plus. To download the source, check out Timekpr Revived on Launchpad. The source or deb files can also be downloaded directly from the PPA.